A trip to Bangkok is not complete without a visit to one of the famous floating markets. Due to the vast network of canals and waterways, Bangkok and the surrounding area, were formerly known as the Venice of the East. People relied on canals for transportation, and therefore people would tend to sell things directly from their boats, and thus giving rise to many floating boat markets. These are the perfect places to immerse yourself in a whole new shopping experience, and taste some of the best local cuisines! 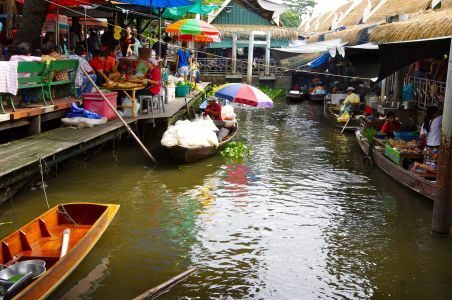 Here are the list of floating markets in Bangkok, mentioned in the order of their popularity. 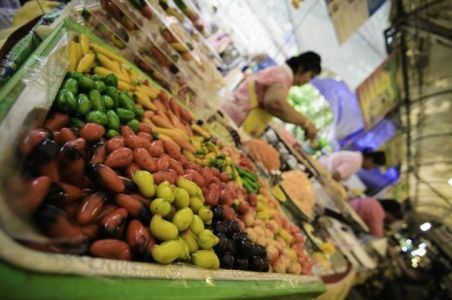 Largest and most colorful market of all (making it usually crowded). It is a best place for photographers, as the place is exteremely lively. You need to leave the hotel early in the morning to see the charm of this place. Wonderful boat tours to hidden temples for just 50 baht per person. The main attraction is Wat Bang Koong temple - which looks as if it has been swallowed by a tree! The famous Maeklong Railway Market is at a distance of 17 kms from this place. Khao lam - flauvored rice stuffed into a pole of bamboo. 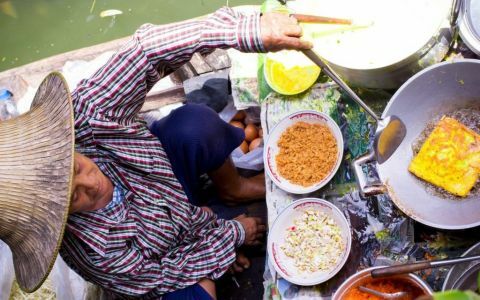 Khlong Lat Mayom is close to the city and is situated in a lovely green lush area with an abundance of good food to eat. Here there are less of floating boats, but more of solid structures next to the waterway, selling stuffs. You can take a boat ride and explore the nearby villages in just 50 THB. Perfect place to try thai noodles, fresh fruit, seafood and other local delicacies. One of the best motorbiking you will ever experience covering 1400 km in 7 days.